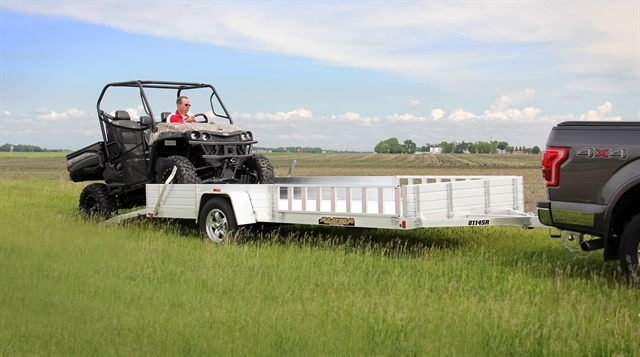 •8114SS - 12" solid front & full length solid sides •8114SR - 12" solid front & 2) 69" x 12" ramps, 12" solid side on balance of trailer •3500# Rubber torsion axle (rated at 2990#) - No brakes - Easy lube hubs •ST205/75R14 LRC radial tires (1760# cap/tire) •Aluminum wheels, 5-4.5 BHP •Aluminum fenders •Extruded aluminum floor •A-Framed aluminum tongue, 48" long with 2" coupler •8) Tie down loops •Swivel tongue jack, 800# capacity •LED Lighting package, safety chains •Aluminum bi-fold rear tailgate - 75.5" wide x 59" long •Overall width = 101.5" •Overall length = 220" •5 Year Warranty! Hello, I would like more information about the 2019 Aluma 8114SR, stock# 194743. Hello, I would like to see more pictures of the 2019 Aluma 8114SR, stock# 194743. Ready to drive this 2019 Aluma 8114SR? Let us know below when you are coming in, and we'll get it ready for you.